The LMC Hard Shell Cracker works by utilizing two Rockwell 54 hard iron rolls to place a hairline fracture in hard shells to make easier to remove product meats from the shells. The LMC Hard Shell Cracker was developed to condition hard shell almond varieties before shelling. 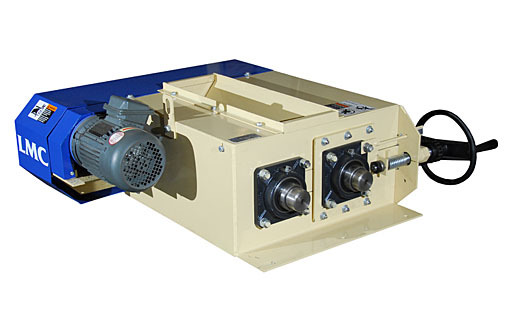 This machine works on the concept of two counter rotating, corrugated rolls, operating at different RPMs. The gap between the rolls is easily adjustable to the proper opening to crack the almonds before shelling. Also, the LMC Hard Shell Cracker is self-cleaning, which means no processing downtime or time-intensive maintenance. LMC only uses corrugated Rockwell 54 hard iron rolls. Our Hard Shell Crackers come standard with an adjustable gap and are self cleaning.